I have added a blogroll to the sidebar of PFStock.com. I actually use Blogger's "My Blog List" feature which shows blog names with the title of its most recent post. Blogs are sorted with the most recently updated blog at the top. I regularly read the posts in my blog list, and I am looking to add more blogs to my blog list. You can have your blog listed for FREE at PFStock. If you have a bona fide personal finance blog, please Email me (my contact information is listed in the sidebar) about exchanging links. Since I regularly read posts from blogs in my blog list, this would automatically increase your readership. Note that I do not currently link to commercial, real estate, or multi-level marketing blogs. Thanks. 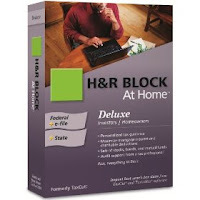 Note: You will also receive an entry in the H&R Block At Home Giveaway if you add PFStock to your blogroll. The folks at H&R Block have provided me a copy of H&R Block At Home Deluxe (retail value $45) to give away to one of my lucky blog readers. H&R Block At Home was formerly known as TaxCut. This giveaway is for a new Deluxe (Tax Year 2009) version of H&R Block At Home which includes tax preparation for both Federal & State returns. That should be adequate for most people to complete their own taxes. Although the software includes free federal e-file, you may have to pay extra if you want to also efile a state return. This drawing is limited to US residents. The software requires Windows XP, Windows Vista, Windows 7, or Mac OS X 10.4.11 or greater. The winner will be picked by random drawing among the valid entries received by February 12th. I will contact the winner to get their mailing address, and I'll pick up the cost of postage. (Note that the software come in a sealed retail box, but it got a little bit crushed when it was mailed to me.) Good luck to everyone who enters! A commenter on my recent post about Yodlee's account aggregation service mentioned another website called Mint.com. I have known about Mint.com for some time, but I've never used them for account aggregation. Another commenter mentioned that Mint runs with a Yodlee backend and provides a "pretty user interface" on the front end. To give credit where credit is due, it looks like Peter Hazlehurst (Senior Vice President at Yodlee) has once again resurfaced. I have said that Yodlee's customer service is fairly responsive, and they have corrected the problems I had experienced with missing and duplicate transactions in my Bank of America and Chase accounts. I also have not received any "Account Error" messages since December 10th, so I take that as a good sign. Getting back to the topic, can anybody who has used both Yodlee and Mint.com tell me what the advantage and disadvantages of each one is? What do other readers think? Thanks. See also: Does Anybody Use Wesabe? Would you rather make 18% in a year on your investment or lose 33% in a year on your investments? Believe it or not there is a subset of investors who would prefer to lose 33% rather than gain 18% on their investments. Let me clarify. The Standard and Poors (S&P) 500 index went down 38.49% (excluding dividends) in 2008. This past year, in 2009, the S&P 500 gained 23.45%. There is a subset of investors who strive to "beat the S&P 500." This perverse group of people would be thrilled to have lost only 33% of their money in 2008 because they would have beaten the S&P 500 by over 5%. This is referred to as "generating positive alpha". (If you didn't invest in the stock market at all and ended up with a 0% return, you would have beaten the S&P 500 by 38% in 2008, and generated 38% positive alpha by doing nothing.) In either case, I didn't exactly see many people celebrating their investment portfolios in 2008. By contrast, these same folks would be bummed out to make only 18% on their investments last year in 2009 because they would have underperformed the S&P 500 by more than 5%. I don't know about you, but I would happy to make 18% in a year on my investments, and would feel ashamed if I had lost 33% in my investments (regardless of how badly the rest of the market is doing). The truth be told, I used to compare my stock performance against the S&P. After I saw how ridiculous that comparison can be, I don't do that anymore. This reminds me of the "keeping up with the Joneses" comparison in personal finance. My advice is not to constantly compare your portfolio performance with the S&P, Nasdaq, or your neighbors. Instead, strive to improve your own position year over year. My final comment is directed to those who still believe that comparing against the S&P 500 index or investing in S&P 500 index funds is a good idea. For the 10-year period ending on December 31, 2009, the S&P 500 index lost 24.1% (excluding dividends). That ought to give you something to think about.